This project was such a joy to work on! 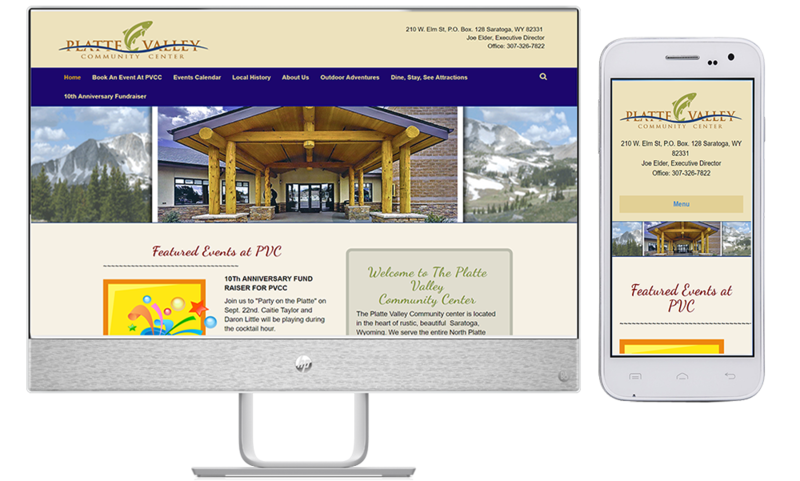 The Platte River Valley Community Center is a social hub for the Wyoming town of Saratoga, and for all of the North Platte Valley. Saratoga (pretty much our favorite small town ever) is known for its access to incredible fishing, excellent hunting, and all the outdoor adventures to be found in Southern Wyoming. The Community Center provides space for cultural, social and civic events. The local population knows about and uses the Center. Now the goal is to extend their reach via online information to all of Wyoming and Northern Colorado. The Center has facilities for weddings, meetings and cultural events of all kinds. Their old site didn't do the place or its mission justice. We developed a site showing it to its best advantage. We've included a helpful events calendar, plus links to local and regional places of interest. Currently, we are working on an AdWords campaign to extend their reach in Wyoming and Northern Colorado.